Greed and inequality leads to bloodshed in the mythical world of Nova. Charlotte's parents are fighting again. As the oldest of four children, Charlotte needs something to distract her three siblings. June, the youngest, takes a quarter from a bag and drops it in a tree-shaped coin bank. But these are no ordinary quarters. The kids are transported to a new world - one that resembles the scene on the back of the coin. That world is Nova, and Nova is at war. The four siblings are now thrust into the middle of this war between the witches and the animal warriors. A raccoon named Ringo offers a way home - but the kids must first fight alongside the animals. Younger sister Ava wants to fight. Charlotte doesn't trust the warriors and wants to look for her own way out. Charlotte and Ava become separated when they each follow their instincts. On their own, each girl discovers mysteries about Nova that place their family in peril. Now Charlotte and Ava have to find one another again - a task wrought with danger and deception - before it's too late. The Challenges of Creating New Worlds in Fantasy Stories. Worldbuilding can be equal parts exciting and infuriating. It's exciting because anything can happen but infuriating for that very same reason. Worldbuilding is a necessary and important part of creating a fantasy novel, but with seemingly infinite possibilities, where does a writer begin? I had to address this very issue when I began writing my book Witches’ Quarters. Witches’ Quarters is a YA fantasy novel based in a fictional world called Nova. The four primary characters enter Nova by dropping a North Dakota commemorative quarter into an enchanted coin bank. The four siblings are taken to Nova and deposited in a scene resembling that of the back of the North Dakota quarter. When I started writing Witches’ Quarters, I had the quarter idea, but I still needed to create the world surrounding it. To do this, I first had to decide if Nova would have the same fundamental laws of the physical world, like gravity and relativity. Ultimately, I chose to keep these sorts of basic rules the same in Nova for a couple of reasons. First, changing basic physical laws would not help my story progress. And with all novels, everything should happen for a reason. Changing the gravitational pull did nothing to help the four siblings find their way home or decide whom to trust in Nova. Second, making these sorts of changes can be complicated and require specialized knowledge. Knowledge that I do not have, and would require a good deal of research to gain. Which I did not do because it wasn’t necessary to tell my story. Once the rules for the characters physical world are set, the next hurdle is creating a social world. All intelligent lifeforms living in groups have a social hierarchy. Therefore, I needed to create one for my characters in Witches’ Quarters. To do this, I had to decide what characters would be in power and what the governmental system would look like. In Witches’ Quarters, I decided to create two social groups, the witches, who came from America, and the natives to Nova, who were intelligent, talking animals. I placed the witches in power and gave them a Monarchy-like social structure. The animals were formed into a democracy with a governing body called the creature counsel. I used these social structures to create one of the central plots of the story. The animals were warring with the witches to regain power over what they viewed as their country. I tossed my four primary characters in the midst of the war and forced them to work out who they believed to be “good” or “bad.” Naturally, the two oldest siblings, Charlotte and Ava, disagreed, which created another major plot point in the story. Once I finished with the social hierarchy, I had to decide what kind of powers I wanted to give individual characters. All power should have limits. An unbeatable character cannot translate into a story. That person simply wins, which isn’t very fun to read. So, in Witches’ Quarters, I chose to give each group of characters their own individual power. I chose to make that power transferrable, which created another major plot point in the story. Greed. Greedy characters hoarded the power of others, becoming stronger and stronger, corrupting them even further. The final and most important challenge in worldbuilding is consistency. No matter what powers a writer chooses to bestow upon his or her characters, it is important to keep them consistent. I chose to allow my characters to steal powers from one another, but I had to make rules as to how a theft could occur. Once those rules were set, I carried them consistently throughout the book. Overall, worldbuilding is a real challenge in writing a fantasy novel. A physical world must be created, followed by a social hierarchy, and finally, individual strengths must be doled out to each character. And all this has to be done within a certain number of pages while telling a story. Which is why worldbuilding is equal parts exciting and infuriating. Creating has infinite possibilities, but books have word limits. That is why creating new worlds is a very delicate art; a careful tightrope walk towards a final story that includes both a unique world and a gripping story. Laura M. Snider is a writer residing in Des Moines, Iowa. She grew up in Topeka, Kansas with seven siblings, one of which is her twin sister. Laura moved to Des Moines in 2006 to attend Law School and fell in love with the city. She still lives in Des Moines and is a managing partner in the law firm Johnson, Bonzer and Barnaby, PLC. Laura lives with her husband, three children, two dogs, and one very old cat. While Laura's career has been law, she has always loved books. And after finding so much joy in the writing of others, Laura decided to start writing novels of her own. It was this love of books coupled with Laura's close-knit family that propelled her to finish her first novel. 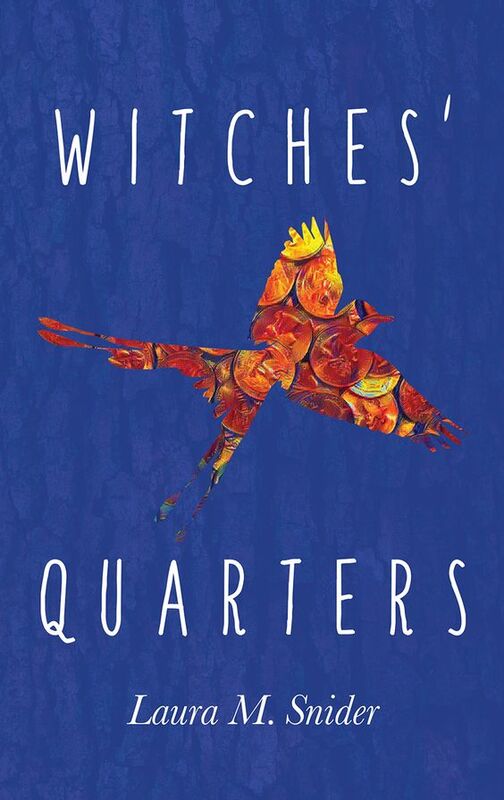 Laura wrote her debut novel, Witches Quarters,' as a Christmas present for her niece, who shares Laura's love of books. I enjoy discovering new authors and this book sounds like quite the adventure.